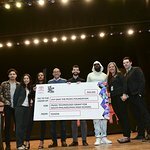 Wyclef and Claudinette Jean speak to the students of Seton Hall University and thank them for volunteering their time to help at the Yéle Haiti Foundation Volunteer Center in South Orange, NJ. Wyclef and the students march from Seton Hall University to the Yele Volunteer center carrying collected donations. Join the movement please visit http://www.yele.org for more information.